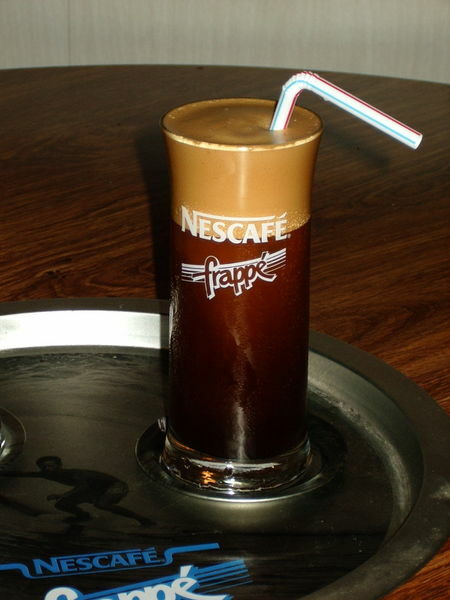 Greek frappé (or Café frappé) is a foam-covered iced coffee drink made from instant coffee (generally, spray-dried). It is very popular in Greece and Cyprus, especially during the summer, but has now spread to other countries. Left: Frappe Coffee as produced by a hand mixer. In French, when describing a drink, the word frappé means shaken or chilled; however, in popular Greek culture, the word frappé is predominantly taken to refer to the shaking associated with the preparation of a café frappé. All varieties may be served with evaporated milk, in which case they may be called φραπόγαλο (frapógalo, "frappé-milk"), or without.